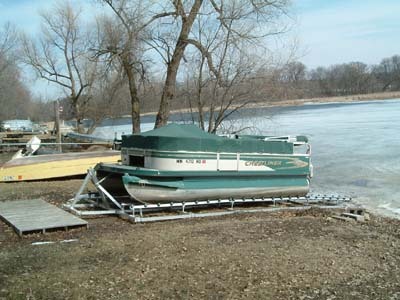 Boat Roller Ramp | Customer Pontoon Roller Ramp Photos | VE-VE Inc.
DDA-2500; 26-1/2 foot long, 2500# capacity, ALUMINUM PONTOON RAMP. NOTE: shown with 2 options. #1) BRA-64;"Disconnect Kit" & #2) BRA-25; "8 ft. Extra Section" (Normal water level dropped below end rollers). NOTE: NOT RECOMMENDED FOR PONTOON BOATS WITH A EXTENDED CENTER TRANSOM MOTOR MOUNT, WERE THE MOTOR IS MOUNTING TO A TRANSOM THAT ACTUALLY EXTENDS OUT PAST THE END OF THE PONTOONS!! NOTICE the pontoon boat in the picture, the transom motor mount is EVEN with the ends of the pontoons!! NOTE: CLICK ON "View Detailed Images" to the left & see LARGER DETAILED PICTURES. Price shown is for DDA-2500 ONLY! NOTE: shown with 1 option. #1) BRA-64;"Disconnect Kit"
NOTE: We do advise to use "Disconnect Kits" to take last section out of water and not allow to let freeze in. NOTE: NOT RECOMMENDED FOR PONTOON BOATS WITH A EXTENDED CENTER TRANSOM MOTOR MOUNT, WERE THE MOTOR IS MOUNTING TO A TRANSOM THAT ACTUALLY EXTENDS OUT PAST THE END OF THE PONTOONS! !